Getting to the head of the pack isn’t easy. While the exact recipe for attaining Alpha status is one that is more art than science, there is no doubt that grit, gusto, and a ton of elbow grease are always required in heavy doses. When it comes to the world of do-all, feature-rich, motorcycle jackets, Olympia has been in the proverbial kitchen for years, and new for the first product launch of 2016, their Alpha Jacket is ready to make its case to climb the ranks. 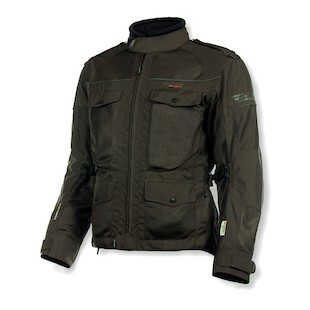 The Olympia Alpha Jacket gets much of its styling from the traditional 4-pocket military design. It makes use of an outer shell comprised of a rugged 500 denier Cordura fabric that is equally adept at providing abrasion resistance as it is guarding against the degradation that can occur over time due to normal wear-and-tear. A large portion of the outer shell also makes use of ballistic airflow mesh panels which allow the Alpha jacket to flow a ton of air on hot days. However, as any rider knows, not all days that you ride are sunny and 85 degrees (but we can dream!). For those days, the Olympia Alpha Jacket also comes fully equipped with a waterproof Thermolite-insulated two-stage liner that works to retain your body heat while shielding you from any precipitation that may choose to fall your way. Additional features include removable CE approved armor at the elbows, shoulders, and back, as well as 3M Scotchlite reflectivity, seven storage pockets, and an 8” connection zipper for Olympia pants. In this the Spring Launch Season of 2016, Olympia is first out of the gate. With jackets such as the new Alpha in their lineup, it is easy to see why they wanted to get started early in the new year and showcase this monster of the road.